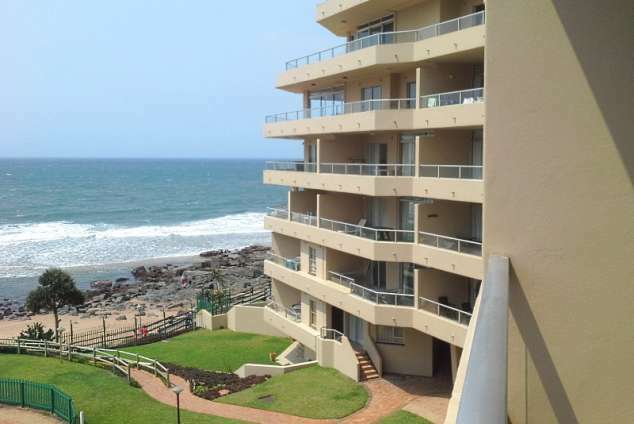 207 Les Mouettes - Ballito Central Accommodation. CLOSER TO THE BEACH you cannot get! Exclusive, upmarket, modern, private and relaxing apartment with BREATH TAKING SEAVIEWS. Situated on the 2nd floor easily accessible by wheel chair as the complex has 2 elevators. Conducive to all year round holiday. Dolphin spotting at sunrise and falling a sleep to the sound of the ocean cannot get better. This apartment is situated in a sought after up-market and secure complex with communal swimming pool, and braai facilities as well as secure undercover parking for guests. There is also trailer storage available and limited additional parking. There is also a large laundry in the complex where you can get washing and ironing done at a very reasonable price. The main bedroom has a King size bed which opens up onto a balcony with its stunning sea views en suite shower vanity and toilet. The 3rd bedroom has two single beds. Second bathroom consists of a shower vanity and toilet. Open plan kitchen, dining room and lounge that open directly on to the large patio with breath taking sea views. The kitchen is equipped with a microwave, oven hob and fridge/freezer, toaster, kettle. Ice machine, George Foreman griller, crockery and cutlery. There is a large granite top Island that comfortably seats 8 people. There is a TV with HP DSTV. The unit has free WI-FI via fibre router. It also has a valid Showmax account. For your convenience, there is also a 24KVA inverter in case of power outages. All 3 bedrooms, lounge and dining area have ceiling fans. It is necessary to bring your own bath and beach towels and dish towels. 1795 page views since 10 Oct, 2018. Last updated on 13 Dec, 2018.